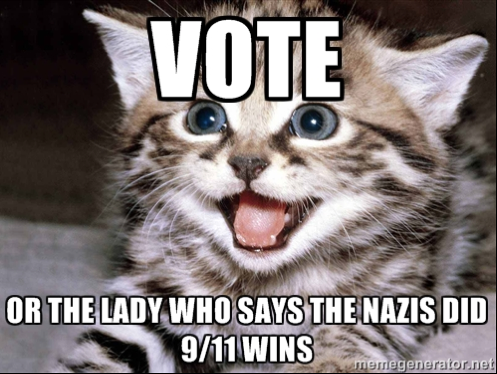 This entry was posted in Uncategorized and tagged 9/11, crazy, election, nazis, vote. Bookmark the permalink. ← Stop Talking to Strange Women on the Street. I’m sure this year she’ll change her tune and tell you that ISIS is running the schools under sharia law. These sad people get tiring, and I agree, there ARE a ton of them out there. And everyone of them votes. The only problem with democracy is the people. “The crazies are getting louder. This happens at each point of rapid and profound change, and it always passes thankfully,” This. This is what I have been saying to myself and a handful of people. I am not religious, yet I pray daily that it comes to pass soon. Too bad, it looked like a nice kitten. OMG, you are a freakin riot!